Wisdom teeth are third molars that grow in the back of your mouth usually in your late teens to mid twenties. If there is sufficient space and room in the mouth, wisdom teeth have the potential to come through straight just like normal teeth and cause no problems. However, it is often the opposite where the jaw is not big enough to accomodate for these extra teeth, and hence require removal. In some cases, the wisdom teeth tend to be wedged or impacted, potentially damaging the tooth in front. Wisdom teeth pain is very common amongst young adults. If removal is required and isn’t too complex, our highly trained dentists would be able to have the procedure done at our Hampton Park practice. However, for unusually complex cases you may be referred to a specialist Oral and Maxillofacial Surgeon for the wisdom teeth to be removed under General Anaesthesia. Once your wisdom teeth are removed at our practice, the dentist may prescribe some antibiotics and analgesics to assist with the healing and discomfort. 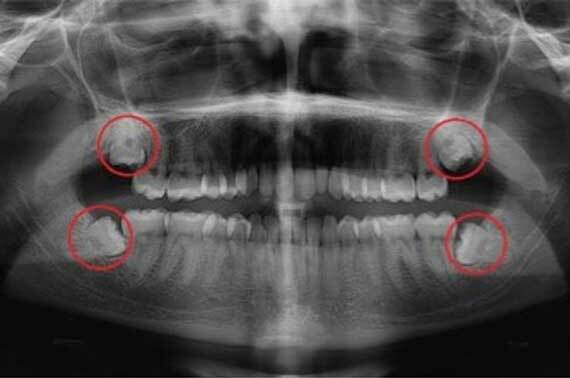 Are your wisdom teeth causing you pain and grief? Call us today to arrange an appointment.